When the first Senna was delivered to North America last month, we have all its details as disclosed by McLaren itself. While everything about the car is wow-worthy, we never had the chance to know how much the car really is, or at least the options that came with the bespoke supercar. Good thing, the Senna made a surprise special appearance somewhere in Connecticut, and The Stradman have captured it on video. Now, if you loved this supercar in photos, you’ll love it even more up close in this video. You can jump to 4:55 mark of the video for the actual car. 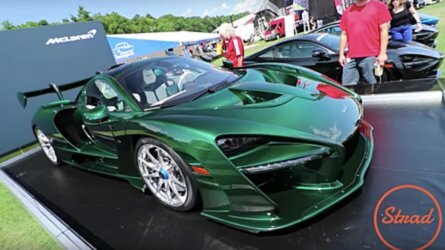 The Vlogger also caught another piece of information about the car – its carbon fiber option is worth $500,000. That’s a lot of money, and we can list more than a handful of things you could buy with 500 grand, but we won’t because you already know that. What’s even more special about this car is its “Fux Green” exterior paint that tinted its carbon-fiber body. If you’re wondering what Fux Green means, well, it’s named after this particular Senna’s owner, Michael Fux of New York City. The green color scheme and intricate weave is found in 67 parts of the body, and took almost 1,000 hours to produce. There’s no doubt why this option is worth 500 grand. The Fux Green carbon fiber parts continues inside the car, too. The green hue contrasts nicely with the white leather seats, accents, and steering wheel. While we’re seeing some detractors of this bespoke creation, or even the Senna itself, we appreciate its greatness because 1) it’s not our car; 2) it’s not our money; and 3) its twin-turbo 4.0-liter V7 that churns out 789 horsepower and 590 pound-feet of torque, launching the supercar to 60 miles per hour from a standstill in 2.7 seconds.